In the present study we evaluated the role of IFN-α in the generation of dendritic cells (IFN-DCs) with priming activity on CD8+ T lymphocytes directed against human tumor Ags. A 3-day treatment of monocytes, obtained as adherent PBMCs from HLA-A*0201+ healthy donors, with IFN-α and GM-CSF led to the differentiation of DCs displaying a semimature phenotype, but promptly inducing CD8+ T cell responses after one in vitro sensitization with peptides derived from melanoma (gp100209–217 and MART-1/Melan-A27–35) and adenocarcinoma (CEA605–613) Ags. However, these features were lost when IFN-DCs were generated from immunosorted CD14+ monocytes. 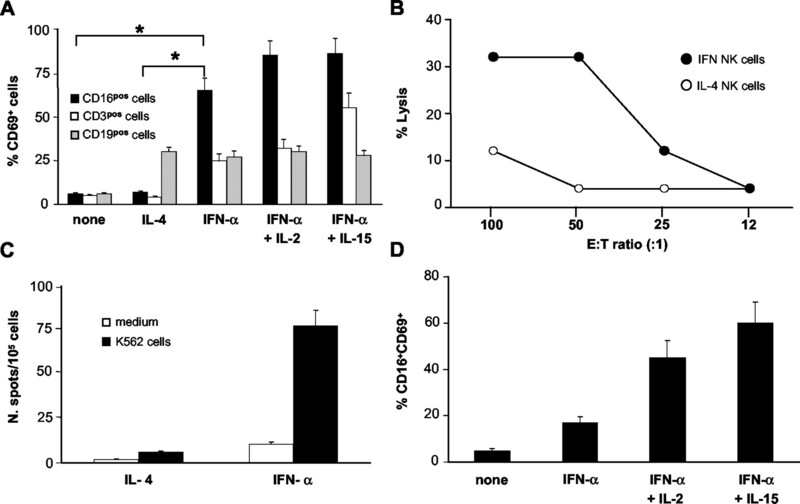 The ability of adherent PBMCs to differentiate into IFN-DCs expressing higher levels of costimulatory molecules and exerting efficient T cell priming capacity was associated with the presence of contaminating NK cells, which underwent phenotypic and functional activation upon IFN-α treatment. NK cell boost appeared to be mediated by both direct and indirect (i.e., mediated by IFN-DCs) mechanisms. Experiments performed to prove the role of contaminating NK cells in DC differentiation showed that IFN-DCs generated in the absence of NK were phenotypically less mature and could not efficiently prime antitumor CD8+ lymphocytes. Reciprocally, IFN-DCs raised from immunosorted CD14+ monocytes regained their T cell priming activity when NK cells were added to the culture before IFN-α and GM-CSF treatment. Together, our data suggest that the ability of IFN-DCs to efficiently prime anti-tumor CD8+ T lymphocytes relied mostly on the positive cross-talk occurring between DCs and NK cells upon stimulation with IFN-α. Dendritic cells (DCs)3 are professional APCs playing a crucial role in the generation and maintenance of immune responses directed against pathogens (1, 2, 3, 4). Moreover, several experimental and clinical studies suggest that these cells are also involved in priming and expanding T lymphocytes directed against tumor Ags (5). The adoptive transfer of DCs differentiated ex vivo from myeloid precursors and loaded with antigenic material has been shown to elicit cytotoxic and Th cell responses, leading to protective immunity in experimental models and to tumor regression in a percentage of cancer patients (6, 7). However, several important features of the ex vivo DC differentiation and maturation procedures are still controversial, and the optimal phenotypic and functional characteristics of DCs to be used in vaccination protocols of cancer patients have yet to be completely defined (8, 9, 10, 11). In vitro DC generation can be achieved by treating myeloid precursors, such as CD14+ monocytes derived from PBMC or CD34+ bone marrow cells, with different mixtures of cytokines and growth factors (2, 3). The standard procedure for generating monocyte-derived DCs is based on a two-step culture protocol, requiring a first incubation with IL-4 and GM-CSF aimed at inducing monocyte differentiation into immature DCs (iDCs), followed by treatment with different maturation stimuli (such as LPS, PGE2, CpG oligonucleotides, IL-1, TNF-α, IFN-γ, Calmette-Guérin bacillus, and CD40 ligand) to obtain fully mature DCs (mDC) (3). The iDCs, which are typically CD14−, CD83−, CD86low, CD80low, CD40low, and HLA-DRlow, are described as highly phagocyting cells with low T cells stimulatory activity. Their cytokine secretion pattern, involving the predominant release of IL-4 and IL-10, has suggested a role for these cells in the induction and maintenance of peripheral immune tolerance (3). Mature DCs are instead characterized by a CD14−, CD83+, CD86high, CD80high, CD40high, HLA-DRhigh phenotype, low phagocytic activity, potent T cell priming ability, and a type 1 cytokine secretion profile that mediates the development of polarized immune responses against foreign and self Ags (1, 2, 3). Recently, an alternative procedure for generating monocyte-derived DCs based on in vitro culture with IFN-α and GM-CSF has been described (12). DCs differentiated in this setting (IFN-DCs) show increased expression of costimulatory molecules and more potent functional activities compared with IL-4-iDCs. These cells undergo complete maturation upon LPS stimulation and migrate in response to β-chemokines, as a consequence of up-regulation of CCR7 and its natural ligand macrophage inflammatory protein-3β (13). Functionally, IFN-DCs exhibit potent allostimulatory activity in an MLR assay (12) and can induce humoral and Th1-polarized cellular responses in SCID mice reconstituted with human PBMCs (12, 13, 14). However, in contrast with antiviral or antiallogeneic responses, the priming of antitumor T cell reactivities could not be easily achieved and may require more efficient Ag-presenting ability to overcome the tolerant state often affecting immune responses directed against tumor Ags (5). Thus, in the present study we wanted to evaluate the ability of IFN-DCs to efficiently prime CD8+ T lymphocytes specifically recognizing antigenic determinants expressed by human tumor cells. In addition, we investigated whether IFN-α-driven DC differentiation could be influenced by other immune cells susceptible to the stimulatory activity of IFN-α and present as contaminating components of adherent PBMCs, which are often used as a source of enriched monocyte preparations. Indeed, IFN-α is known to exert a pleiotropic effect on multiple cell subsets, including NK cells and B lymphocytes (15, 16, 17). These cell subsets could, in turn, promote positive interactions with differentiating DCs and favor their development into activated and functionally potent APCs. In fact, the ability of different immune cell components, such as NK cells, to finely tune DC activation and to mediate reciprocal contacts leading to an activating cross-talk has been recently shown to play a central role in the regulation of innate immunity (18, 19, 20, 21, 22, 23). In this study we report that IFN-DCs generated from adherent monocyte-enriched PBMCs are characterized by a semimature phenotype, but exert efficient T cell priming activity toward CD8+ T cells recognizing different human tumor Ags. Furthermore, we show that the positive DC/NK cell cross-talk promoted by IFN-α is largely responsible for the antitumor T cell priming ability of IFN-DCs. Cells were cultured in X-VIVO 15 medium (BioWhittaker, Walkersville, MD) supplemented with 2 mM glutamine (BioWhittaker Europe, Verviers, Belgium), 100 U/ml penicillin (Penicillina G sodica; Pharmacia, Milan, Italy), 100 mg/ml gentamicin (Gentalyn 80; Schering-Plough, Milan, Italy), and 1% HEPES buffer (Bio-Whittaker Europe). The following human cytokines were used: GM-CSF (Mielogen; Schering-Plough), natural leukocytic IFN-α (Alfa Wassermann, Alanno, Italy), TNF-α (PeproTech, Rocky Hill, NJ), IFN-γ (PeproTech), IL-1β (PeproTech), IL-2 (Proleukin; Chiron, Milan, Italy), IL-4 (PeproTech), IL-6 (PeproTech), and IL-15 (Pierce, Rockford, IL). All the cytokines used in this study were produced as endotoxin-free preparations. PBMCs were obtained from whole blood or buffy coats of healthy HLA-A*0201+ blood donors by Ficoll-Paque density gradient centrifugation (Pharmacia Biotech, Uppsala, Sweden). Monocytes were obtained from PBMCs as a cell fraction adherent to plastic after a 2-h incubation in six-well culture plates or in 25- or 150-cm2 culture flasks (Costar Corning, Corning, NY) in the presence of serum-free RPMI 1640 medium (Bio-Whittaker Europe). Alternatively, monocytes were purified from PBMCs by MACS using human CD14 MicroBeads (Miltenyi Biotec, Bergisch Gladbach, Germany), according to the manufacturer’s protocol. After this procedure, the resulting cell population was represented by >95% CD14+ monocytes, as assessed by flow cytometry. IFN-DCs were obtained by culturing adherent cells or immunosorted CD14+ monocytes (2 × 106 cells/well, in 24-well plates) for 3 days in X-VIVO 15 medium containing GM-CSF (1.000 U/ml) and IFN-α (104 U/ml). The dose of 104 U/ml IFN-α was chosen on the basis of the higher expression of costimulatory and activation markers achieved in IFN-DCs compared with 103 U/ml. Only doses >104 U/ml mediated significant toxicity and cell death. IL-4-iDCs were obtained by culturing adherent cells for 6 days in X-VIVO 15 medium containing GM-CSF (1.000 U/ml) and IL-4 (20 ng/ml). IL-4-mDCs were obtained culturing iDCs for 48 h in the presence of TNF-α (20 ng/ml) and LPS (10 μg/ml; Escherichia coli 026:B6; Sigma-Aldrich, Milan, Italy). For the in vitro sensitization of tumor Ag-specific T cells, mDCs were obtained from iDCs by a 48-h culture in the presence of TNF-α (50 ng/ml), IFN-γ (1000 U/ml), IL-1β (20 ng/ml), and IL-6 (1000 ng/ml). Blocking experiments with the anti-TNF-α neutralizing mAb (ab9813; Abcam, Cambridge, U.K.) were performed by adding 0.5 μg/ml mAb to the differentiating IFN-DC cultures every 18 h.
At the end of cytokine treatment, adherent and nonadherent cells were harvested by extensive mechanical removal with a cell scraper (Coulter Corning) and used for subsequent analysis. Complete recovery of adherent cells was checked by optical microscopy. NK cells were purified from PBMCs by immunomagnetic cell sorting using the NK Cell Isolation Kit (Miltenyi Biotec), according to the manufacturer’s instructions, or by incubation with PE-anti-human CD16 mAb (BD PharMingen, San Diego, CA) and subsequent MACS with anti-PE microbeads (Miltenyi Biotec), according to the manufacturer’s protocol. The purity of isolated NK cells was >95%, as assessed by flow cytometry. For studying the effect of IFN-α on isolated NK cells, the sorted population (2 × 106 cells/well, in 24-well plates) was cultured for 3 days in X-VIVO 15 medium supplemented with IFN-α (104 U/ml) in the absence or the presence of IL-2 (600 IU/ml) or IL-15 (50 ng/ml). CD19+ B cells were purified from PBMCs after incubation with the PE-anti-human CD19 mAb (BD PharMingen), followed by MACS with anti-PE microbeads (Miltenyi Biotec), according to the manufacturer’s protocol. The purity of isolated CD19+ B cells was >95%, as assessed by flow cytometry. CD16-negative PBMCs were obtained by depleting CD16+ cells through a first incubation with PE-anti-human CD16 mAb (BD PharMingen), followed by MACS with anti-PE microbeads (Miltenyi Biotec), according to the manufacturer’s protocol. After this sorting procedure, residual CD16+ NK cells were <3%, as assessed by flow cytometry. For reconstitution assays, immunoselected CD19+ B cells or CD16+ NK cells were added to purified CD14+ monocytes, with a 1:5 CD16+:CD14+ and a 1:3 CD19+:CD14+ ratio (2 × 106 cells/well, in 48-well plates), to reconstitute the cellular composition observed in the adherent PBMCs used for these experiments. The following fluorochrome-conjugated mouse anti-human IgG mAbs were used for immunofluorescent staining: PE-anti-CD11c, PE-anti-CD14, PE-anti-CD16, PE-anti-CD19, PE-anti-CD80, PE-anti-CD86; FITC-anti-CD40, FITC-anti-CD83, FITC-anti-HLA-DR, FITC-anti-CD69, FITC-goat anti-mouse IgG1; allophycocyanin-anti-CD56; PerCP-anti-CD3 (BD PharMingen, San Diego, CA), and PE-goat anti-mouse IgG1 (DakoCytomation, Glostrup, Denmark). For immunofluorescent staining, cells were washed and resuspended in PBS supplemented with 1% FCS, incubated with fluorochrome-conjugated mAbs for 30 min at 4°C, and then washed with the same buffer. In each experiment isotypic controls were used. For the staining with anti-NKG2D mAb, cells were washed and resuspended in PBS supplemented with 1% FCS and incubated for 30 min at 4°C with the primary nonconjugated purified anti-NKG2D IgG1 mAb(provided by Dr D. Pende, Istituto Nazionale per lo Studio e la Cura dei Tumori, Genova, Italy). After one wash with PBS supplemented with 1% FCS, cell samples were incubated with the secondary PE-goat anti-mouse IgG1 mAb (DakoCytomation) for 30 min at 4°C and then washed with the same buffer. Cells were then analyzed by flow cytometry. Data were collected and analyzed using a FACScan or a FACSCalibur flow cytometer (BD Biosciences, San Jose, CA), and data analysis was performed with CellQuest software (BD Biosciences). Cells were gated according to light scatter properties to exclude cell debris and contaminating lymphocytes. To test FITC-dextran internalization, DCs (5 × 105/well, in 48-well plates) were resuspended in PBS supplemented with 5% human serum, incubated at 37 or 4°C (as a specificity control) for 15 min, and then treated with 1 mg/ml FITC-dextran (Molecular Probes, Leiden, The Netherlands). After 30 min the reaction was stopped with cold PBS supplemented with 5% human serum and 0.1% sodium azide. Cells were washed three times with the same buffer and analyzed with a FACScan or FACSCalibur flow cytometer. Phagocytic cells were identified as single positive events. To evaluate tumor cell phagocytosis, 107/ml melanoma cells (624.28mel) were stained at 37°C in RPMI 1640 medium with 5 mM CFSE (Molecular Probes). After 10 min, staining was stopped by the addition of an equivalent volume of human serum. Labeled cells were washed twice in RPMI 1640, resuspended in X-VIVO 15 medium, irradiated with 400 mJ/cm2 UV-B to induce apoptosis, and finally incubated at 37°C. After 24 h, apoptotic cells were >80%, as evaluated by propidium iodide staining and cytofluorometric analysis. Necrotic 624.28mel melanoma cells were obtained after four cycles of rapid freezing/thawing, which induced death in >95% cells, as assessed by trypan blue dye. Phagocytic activity was then evaluated by incubating DCs with apoptotic or necrotic tumor cells (1:3 DC:tumor cell ratio) in X-VIVO 15 medium at 37 or 4°C (specificity control). After 2 h, DCs were stained with the PE-anti-CD11c mAb and phagocytic cells were identified as double-positive events. To prime Ag-specific CD8+ T cells, DCs were pulsed for 2 h at 37°C with 2 mM peptides. The following HLA-A*0201-restricted epitopes were used: Flu M158–66 (derived from the influenza FluA matrix protein M1), EBV (a pool of five EBV peptides: LMP-2426–434, EBNA-3C284–293, BMLF-1280–288, EBNA-3A596–604, and gp350842–850), MART-1/MelanA27–35, MART-1/MelanA27–35/1L, gp-100209–217 (derived from the melanoma Ags MART-1/Melan-A and gp100, respectively), CEA571–579/6D (derived from carcinoembryonic Ag molecule), and Her2-neu654–662. All peptides were provided by Neosystem (Strasbourg, France) as >95% pure preparations. Peptide-pulsed DCs were then irradiated at 3000 rad and cocultured in 24-well plates with autologous PBMCs (1:4 DC:PBMC ratio) in X-VIVO-15 medium for 1 wk. Culture medium was supplemented with 120 IU/ml IL-2 on day 2 and 60 IU/ml on day 5 of culture. After 1 wk of culture, Ag-specific T cell responses against defined HLA-A*0201-restricted peptide were determined by IFN-γ ELISPOT (Mabtech, Nacka, Sweden) according to the manufacturer’s instructions. In each well, 16.7 × 103 T2 cells, alone or previously pulsed with 2 mM peptide, were seeded with 104 cells from PBMC/DC cultures in anti-IFN-γ mAb-coated, 96-well plates (ELISPOT HP; Millipore, Bedford, MA). For HLA-I blocking experiments, peptide-pulsed T2 cells were pretreated with the W6.32 mAb, recognizing a nonpolymorphic epitope of HLA-A, -B, and -C molecules (24). After 18 h of incubation at 37°C, IFN-γ-secreting cells were identified as spot-forming cells by a computer-assisted system ELISPOT Reader (Bioline, Torino, Italy). Data were analyzed with 2.5 ELISPOT AID software (Autoimmune Diagnostika, Strasburg, Germany). Similarly, NK cell activation was determined by IFN-γ ELISPOT (Mabtech), to measure IFN-γ release in response to K562 NK-sensitive cells. To this aim, 16.7 × 103 K562 target cells were incubated with 105 adherent PBMCs cultured for 3 days with IFN-α and GM-CSF for DC differentiation or with 104 CD16+ immunosorted cells cultured in the same conditions. After 18 h of incubation at 37°C, spot-forming cells were quantified as described above. TNF-α and IL-12 secretion by DCs was evaluated by ELISPOT (Mabtech) according to the manufacturer’s instructions. DCs generated from different PBMC sources and with different differentiating protocols were seeded at 3 × 104 cells/well and incubated in X-VIVO 15 medium at 37°C for 18 h. Spot-forming cells were quantified by the computer-assisted system ELISPOT Reader described above. NK cell cytotoxicity was evaluated by a 4-h 51Cr release assay to test their ability to lyse NK-sensitive Daudi target cells. One thousand 51Cr-labeled target cells per well were cocultured for 4 h with the appropriate effectors at E:T cell ratios of 100:1, 50:1, 25:1, and 12:1. Spontaneous target lysis was evaluated by incubating target cells with medium, whereas total target lysis was determined by treatment with 2% Nonidet P-40 detergent-supplemented medium. The percentage of specific lysis was calculated as follows: [(experimental cpm − spontaneous cpm)/(total cpm − spontaneous cpm)] × 100. Spontaneous release was always <15%. The assay was performed in triplicate. To characterize the differentiation state of IFN-DCs, we initially evaluated the phenotypic profile in terms of activatory and costimulatory marker expression and the phagocytic activity of these cells compared with those of conventional DCs. 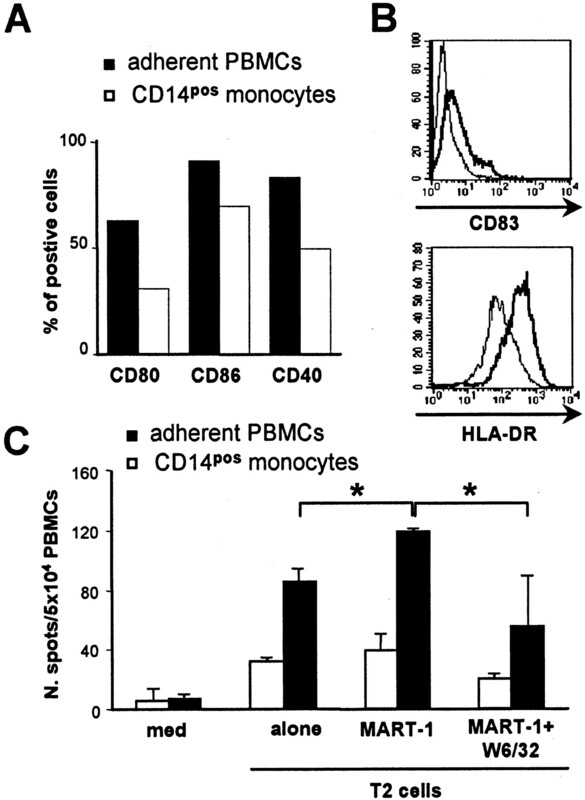 Monocytes isolated from PBMCs by plastic adherence were thus induced to differentiate into DCs by culture in synthetic, serum-free complete medium added with IFN-α and GM-CSF. After 3 days, IFN-DCs displayed a consistently more mature phenotype than that exhibited by iDCs (generated from the same adherent PBMCs by culture for 6 days in the presence of IL-4 and GM-CSF), with higher expression of the activation and maturation surface markers HLA-DR, CD80, CD86, CD40, and CD83 (Fig. 1⇓A). However, IFN-DCs appeared to express lower levels of these molecules compared with mDCs (obtained from iDCs after 48-h culture with TNF-α and LPS; Fig. 1⇓A). In contrast, IFN-DCs displayed a pattern of phagocytic activity more similar to mDCs than to iDCs (Fig. 1⇓, B and C). In fact, although limited phagocytic activity of dyed dextran or apoptotic tumor cells could be observed on day 1 of differentiation (when CD14 down-regulation was already detectable, and the expression of costimulatory molecules was low; data not shown), such activity was completely lost after 3 days of differentiation with IFN-α (Fig. 1⇓, B and C). Overlapping results were obtained when tumor lysate, instead of apoptotic tumor cells, was used for assessing IFN-DC phagocytosis (data not shown). Phenotype and phagocytic activity of IFN-DCs. DCs were differentiated from plastic-adherent PBMCs by treatment for 3 days with GM-CSF and IFN-α (IFN-DCs) or for 6 days with GM-CSF and IL-4 (IL-4 iDCs). IL-4-mDCs were obtained by culturing iDCs for 48 h in the presence of TNF-α and LPS. A, Immunophenotypic analysis: expression of the indicated activation and maturation markers (bold lines) was assessed by immunocytofluorometric analysis. Gray areas correspond to the staining with isotype-matched Ig controls. B, Apoptotic tumor cell phagocytosis: IL-4-iDCs and IFN-DCs (on days 1 and 3 of IFN-α treatment) were incubated with CFSE-labeled apoptotic melanoma cells (624.38 mel) at 37 or 4°C as a specificity control. Cells were subsequently stained with PE-anti-CD11c mAb to identify phagocytic cells as double-positive events. C, FITC-dextran internalization: IL-4-iDCs and IFN-DCs (on days 1 and 3 of IFN-α treatment) were incubated with FITC-dextran at 37°C (bold lines) or 4°C for a specificity control (gray area). Phagocytic cells were identified as single FITC-positive events. Data were analyzed by FACSCalibur and CellQuest. Results are representative of three independent experiments. We then evaluated the ability of IFN-DCs to induce CD8+ T cell responses against human tumor Ags. IFN-DCs were pulsed with HLA-A*0201 binding epitopes derived from Ags expressed by melanoma (MART-1/Melan-A and gp100) or carcinoma (CEA) cells and cultured for 1 wk in the presence of autologous PBMCs. Reactivity was subsequently determined by measuring IFN-γ release in response to T2 cells pulsed with relevant as well as irrelevant peptides. As reported in Fig. 2⇓ (A and B), IFN-DCs were able to induce Ag-specific T cell responses after a single cycle of in vitro stimulation. Such recognition was mediated by CD8+ T lymphocytes and occurred in an HLA class I-restricted fashion, as it was significantly blocked by target treatment with the anti-class I HLA mAb W6.32 mAb (Fig. 2⇓, C and D). Under identical experimental conditions, conventional IL-4-iDCs were unable to elicit any tumor Ag-specific T cell response, although they could induce CD8+ T cell responses against highly immunogenic viral epitopes, such as those derived from influenza virus (Fig. 2⇓E). In contrast, IFN-DCs triggered MART-1/Melan-A-specific CD8+ T cell responses in a similar fashion as IL-4-mDCs (Fig. 2⇓F), thus showing a potent priming activity on antitumor T cells despite their intermediate maturation state. In vitro priming of tumor Ag-specific CD8+ T cells by peptide sensitization with IFN-DCs. IFN-γ release by PBMCs derived from HLA-A*0201+ healthy donors and cultured for 1 wk in the presence of autologous IFN-DCs (▪) or IL-4-iDCs (□), previously pulsed with MART-1/Melan-A 27–35 (A) or CEA571–579 (B) peptides, and exogenous IL-2 (120 IU/ml). 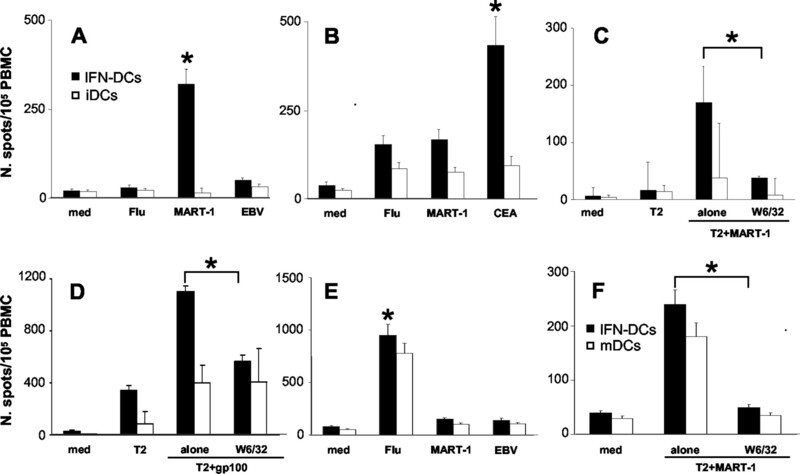 IFN-γ release by lymphocytes alone (med) or incubated with T2 cells pulsed with relevant or irrelevant (M1-Flu and EBV-derived) peptides was evaluated by ELISPOT assay. To prove TCR involvement and HLA-I restriction, anti-gp100209–217 (C) or anti-MART-1/Melan-A27–35 (D) lymphocytes induced by peptide-pulsed IFN-DCs or IL-4-iDCs were tested for IFN-γ release in response to relevant peptide-pulsed T2 cells in the presence or the absence of the anti-class I HLA mAb W6.32. IFN-DCs or IL-4-iDCs pulsed with Flu-M158–66 peptide were also tested for the ability to generate virus-specific T cells (E). Lymphocytes stimulated with MART-1/Melan-A27–35 peptide-pulsed IFN-DCs (▪) or IL-4 mDCs (□) were tested for IFN-γ release in the presence or the absence of the anti-class I HLA mAb W6.32; spots produced in the presence of T2 cells pulsed with irrelevant peptide (Her2-neu654–662) were subtracted (F). Data are representative of three independent experiments. ∗, p < 0.05 compared with T2 cells pulsed with irrelevant peptide or T2 cells pulsed with relevant peptide in the absence of anti-class I HLA mAb (evaluated by Student’s t test, using two-tailed distribution of paired samples). It has been recently demonstrated that DC differentiation and maturation can be influenced by the reciprocal interactions that these cells can establish with other immune subpopulations (such as NK cells) through a mechanism of intercellular cross-talk (20). As IFN-DCs were generated from monocytes enriched from PBMCs by plastic adherence, we investigated whether the ability of IFN-α to promote a pleiotropic effect on nonmonocytic cells contaminating PBMC adherent fraction could play a role in modulating IFN-DC phenotype and immunostimulatory activity. To prove this hypothesis, we first analyzed the phenotypical and functional differences occurring between IFN-DCs derived either from adherent PBMCs or CD14+-immunoselected monocytes (represented by >95% CD14+ cells). As shown in Fig. 3⇓, IFN-DCs generated from adherent PBMCs displayed a more mature phenotype than that of IFN-DCs derived from immunosorted CD14+ monocytes, with higher expression of the activation and maturation markers CD83, CD40, CD80, CD86, and HLA-DR in terms of both percentage of positive cells (Fig. 3⇓A) and fluorescence intensity (Fig. 3⇓B). These phenotypic differences were associated with a more efficient ability of DCs to induce specific CD8+ T cell responses directed against tumor Ags. As depicted in Fig. 3⇓C, IFN-γ release in response to gp100 and MART-1/Melan-A peptides could, in fact, be detected in T cells primed with IFN-DCs derived from adherent cells, but not from immunoselected CD14+ pure monocytes. Effect of monocyte source on IFN-DC phenotype and T cell priming ability. A, Immunophenotypic analysis of the indicated marker expression in IFN-DCs differentiated either from plastic adherent PBMCs (▪) or from immunoselected CD14+ cells (□), reported as a percentage of positive cells. B, CD83 and HLA-DR expression in IFN-DCs differentiated from plastic-adherent PBMCs (bold lines) or from immunoselected CD14+ cells (thin lines). Data were analyzed by FACSCalibur and CellQuest. C, IFN-γ release by HLA-A*0201+ PBMCs cultured for 1 wk in the presence of autologous IFN-DCs derived from plastic adherent PBMCs (▪) or from immunoselected CD14+ cells (□) and pulsed with MART-1/Melan-A27–35 peptide. IFN-γ production was evaluated by ELISPOT assay in the absence (med) or the presence of T2 cells alone or in cells pulsed with MART-1/Melan-A peptide (treated or not with the anti-class I HLA mAb W6.32). Results are representative of three independent experiments. ∗ p < 0.05 compared with T2 cells pulsed with irrelevant peptide or T2 cells pulsed with relevant peptide in the absence of anti-class I HLA mAb (evaluated by Student’s t test, using two-tailed distribution of paired samples). Considering the cellular subsets present in the PBMC plastic-adherent fraction, the majority of these cells were composed of CD14+ monocytes (mean value, 56%). However, a considerable contamination of CD19+ B cells (27%), CD16+ cells (11%), and CD3+ cells (6%) could also be detected (Fig. 4⇓A). Adherent CD16+ cells could be identified as NK cells, given their simultaneous expression of the NK cell markers CD56 and NKG2D (Fig. 4⇓B). Thus, we analyzed whether IFN-α could lead to the activation of adherent NK, B, or T cell subsets, detected in terms of up-regulated expression of the activation marker CD69. In adherent PBMCs cultured for 3 days with IFN-α and GM-CSF, a remarkable increase in CD69 was detected in CD16+CD56+ NK cells, whereas a modest or no up-regulation of the activation marker was observed in CD19+ B or CD3+ T lymphocytes, respectively (Fig. 5⇓A). No significant change in the percentage of different adherent subpopulations was observed (data not shown). The activatory effect achieved by IFN-α was almost comparable to that obtained by the further addition of cytokines with specific stimulatory activity on NK cells such as IL-2 or IL-15, which were used as positive controls (Fig. 5⇓A). In contrast, no sign of NK cell activation could be detected when adherent PBMCs were differentiated into DCs by culture in the presence of IL-4, which, instead, induced a modest up-regulation of CD69 in CD19+ B cells (Fig. 5⇓A). Characterization of cell subsets present in plastic-adherent PBMCs. A, PBMCs adherent to plastic after 2-h incubation in RPMI 1640 medium were analyzed by flow cytometry for the expression of the indicated markers. Data, reported as the percentage of positive cells, refer to the mean value obtained with PBMCs from three different donors. B, CD16+ cells present in the adherent PBMC fraction were further characterized by flow cytometry for the expression of CD56 (left panel) and for the coexpression of NKG2D by gated CD16/CD56 double-positive cells (right panel). Data were analyzed by FACSCalibur and CellQuest. Results are representative of three independent experiments. Phenotypical and functional activation of NK cells by IFN-DCs or IFN-α alone. A, The percentage of CD69+ cells within the CD16+ (▪), CD3+ (□), or CD19+ (▦) subsets was evaluated in adherent PBMCs cultured for 6 days with IL-4 and GM-CSF to generate iDCs (IL-4) or for 3 days with IFN-α and GM-CSF to promote differentiation of IFN-DCs (IFN-α). The addition of 600 IU/ml IL-2 or 50 ng/ml IL-15 to IFN-DC cultures was included as a positive control for NK activation. Untreated adherent PBMCs were also included (none). The expression of the activation marker CD69 was evaluated by flow cytometry. Data were analyzed by FACSCalibur and CellQuest. ∗, p < 0.05 compared with untreated or IL-4 treated cells (evaluated by Student’s t test, using two-tailed distribution of paired samples). B, Cytotoxic activity on Daudi cells by NK cells present in adherent PBMCs differentiated into IL-4 iDC or IFN-DCs, as evaluated by a 4-h 51Cr release assay. C, IFN-γ release by adherent PBMCs differentiated into IL-4 iDC or IFN-DCs in response to K562 cells, as assessed by ELISPOT analysis. D, Direct effect of IFN-α on NK cells was evaluated by culturing purified CD16+ cells for 3 days in the presence of IFN-α alone or in combination with IL-2 (600 IU/ml) or IL-15 (50 ng/ml) as positive controls. Untreated NK cells were additionally analyzed (none). Results are reported as the percentage of CD16/CD69 double-positive cells. Data were analyzed by FACSCalibur and CellQuest. Results are representative of three independent experiments. CD69 up-regulation in NK cells contaminating IFN-DC cultures was associated with increased effector functions, as suggested by the enhanced cytotoxic activity and IFN-γ secretion in response to specific NK-sensitive targets such as K562 and Daudi cells (Fig. 5⇑, B and C). No change in the recognition of these targets was instead observed in NK cells contaminating IL-4 iDC cultures (Fig. 5⇑, B and C). With the aim of investigating whether NK activation in differentiating DC cultures could be induced by the direct activity of IFN-α on these cells, immunosorted CD16+ NK cells were cultured with IFN-α alone (at the dose used for DC differentiation) or in combination with IL-2 and IL-15 as positive controls. As reported in Fig. 5⇑D, IFN-α induced a detectable increase in CD69 expression in NK cells, although it was significantly lower than that observed in the additional presence of IL-2 and IL-15. These latter data suggest that the NK activation observed in IFN-DC cultures was mostly induced by an indirect mechanism(s) mediated by IFN-differentiating DCs and was only partially due to the direct effect of IFN-α on the NK cell subset. To evaluate the contribution of activated NK cells to IFN-DC differentiation, we removed CD16+ NK cells from adherent PBMCs by immunosorting and compared the phenotypical and functional characteristics of IFN-DCs differentiated in this setting with those displayed by IFN-DCs generated from adherent PBMCs. As depicted in Fig. 6⇓A, the removal of CD16+ NK cells from differentiating IFN-DC cultures was associated with decreased levels of CD83, CD86, and HLA-DR molecules in differentiated IFN-DCs. Additionally, NK cell removal from adherent PBMCs led to the generation of IFN-DCs with reduced priming activity on tumor Ag-specific T cells. In fact, class I HLA-restricted IFN-γ release in response to gp100- and MART-1/MelanA-derived peptides could be observed only when T cells were sensitized by IFN-DCs differentiated from adherent PBMCs, whereas no priming activity was detected when T cells were stimulated with IFN-DCs raised in the absence of CD16+ cells (Fig. 6⇓B). Activated NK cells present in differentiating IFN-DC cultures raised from adherent PBMCs were not directly responsible for the improved T cell priming, as CD16+ NK cell depletion at the end of the 3-day differentiation process did not abolish the generation of peptide-specific T cells (Fig. 6⇓B). Furthermore, the ability of IFN-DCs to efficiently activate tumor-specific T cells could be fully recovered by the addition of CD16+, but not CD19+, cells to CD14+ monocytes before IFN-DC differentiation. In fact, whereas IFN-DCs derived from CD14+ cells alone or in the presence of CD19+ lymphocytes were unable to induce any Ag-specific, T cell-mediated activity, IFN-DCs derived from CD14+ cells cocultured with CD16+ cells could trigger specific T cell responses, comparable to those obtained by IFN-DCs raised from adherent PBMCs (Fig. 6⇓C). Effect of NK/DC cross-talk on phenotypic and functional characteristics of IFN-DCs. A, Expression of the indicated markers, as analyzed by flow cytometry, in IFN-DCs derived either from adherent PBMCs (thin line) or PBMCs depleted from CD16+ cells before plastic adherence (bold line). Data were analyzed by FACSCalibur and CellQuest. B, IFN-γ release by PBMCs cultured with autologous MART-1/Melan-A27–35 peptide-pulsed IFN-DCs derived from adherent PBMCs (▪), PBMCs depleted from CD16+ cells before plastic adherence (□), or adherent PBMCs depleted from CD16+ cells at the end of the 3-day IFN culture (▦). Lymphocytes were tested in an IFN-γ ELISPOT assay in the presence of medium (med) or T2 cells, alone or pulsed with MART-1/Melan-A27–35 peptide. Peptide-pulsed T2 cells were additionally preincubated with the anti-class I HLA mAb W6.32 to prove TCR involvement. C, IFN-γ release by PBMCs cultured with autologous MART-1/Melan-A27–35/1L peptide-pulsed IFN-DCs derived from CD14+ purified cells alone (▦) or in the presence of CD19+ B cells (□) or CD16+ NK cells (▪). MART-1/Melan-A27–35/1L peptide-pulsed IFN-DCs raised from adherent PBMCs were also used as a positive control (▨). Lymphocytes were tested in an IFN-γ ELISPOT assay in the presence of medium (med) or T2 cells, alone or pulsed with MART-1/Melan-A27–35/1L peptide. Peptide-pulsed T2 cells were additionally preincubated with the anti-class I HLA mAb W6.32. D, TNF-α secretion in IFN-DC cultures differentiated from adherent PBMCs or from PBMCs depleted from CD16+ cells before plastic adherence. IL-4 mDCs generated from adherent PBMCs were also used as a positive control. TNF-α secretion was evaluated by ELISPOT. ∗, p < 0.05 compared with IFN-DCs raised from CD16+-depleted adherent PBMCs (evaluated by Student’s t test, using two-tailed distribution of paired samples). E, Expression of CD83 by IFN-DCs derived from adherent PBMCs in the absence or the presence of a neutralizing anti-TNF-α Ab during the 3-day differentiation process. IFN-DCs generated from CD16+-depleted adherent PBMCs were also included in the analysis. CD83 expression was evaluated by flow cytometry. Data were analyzed by FACSCalibur and CellQuest. Results are representative of three independent experiments. 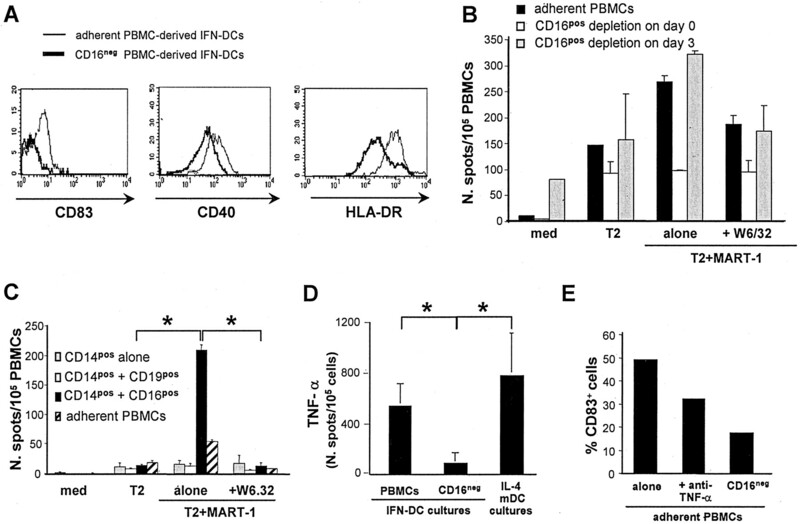 The more mature phenotype observed in IFN-DCs generated from adherent PBMCs in the presence of NK cells was paralleled by the production in differentiating IFN-DC cultures of remarkable amounts of TNF-α, similar to that released by IL-4-mDCs (Fig. 6⇑D). The evidence that TNF-α was instead undetectable in DC cultures raised from CD16-depleted PBMCs (Fig. 6⇑D) suggested that this cytokine, released by either NK cells or DCs, could represent an important factor contributing to reciprocal maturation and activation of these two cell subsets. Indeed, as reported in Fig. 6⇑E, the expression of activatory molecules, such as CD83, on IFN-DCs raised from adherent PBMCs was significantly decreased by the addition of an anti-TNF-α neutralizing mAb. However, anti-TNF-α mAb treatment did not completely reduce CD83 expression to the level displayed by IFN-DCs raised from CD16-depleted adherent PBMCs (32 vs 17%; Fig. 6⇑E), suggesting that other soluble factors, alone or in conjunction with the requirement for cell-to-cell contact, could be involved in the positive cross-talk occurring between NK cells and DCs upon IFN-α treatment. In this regard, it is worth mentioning that IFN-DC differentiated from adherent PBMCs did not release significant levels of IL-12 (data not shown). This cytokine, which was hypothesized to play a role in the DC/NK positive interaction (25), is thus unlikely to be involved in promoting the cross-talk observed under these experimental conditions. IFN-α has been recently shown to induce the rapid maturation of monocytes into DCs (IFN-DCs) displaying potent priming activity on virus-specific T lymphocytes and functional characteristics typical of mature cells (12, 14, 26). This recent knowledge about the interactions between IFN-α and DCs has thus opened new perspectives in the use of this cytokine as vaccine adjuvant as well as in strategies for the development of DC-based immunotherapy (12, 13). In the present study we show that human IFN-DCs generated ex vivo from adherent PBMCs display a semimature phenotype with suboptimal expression of CD83, HLA class II, and costimulatory molecules, but mediate efficient activation of tumor-specific CD8+ T cells in vitro. However, we also report that the T cell priming activity of these cells appears to be strictly dependent on the positive cross-talk occurring, upon IFN-α treatment, between DCs and NK cells present as contaminating components of adherent PBMCs. Our hypothesis on the role of positive DC/NK cross-talk in the development of fully functional IFN-DCs was initially supported by the finding that adherent PBMC-derived DCs could mediate prompt activation of tumor-specific CD8+ T lymphocytes, whereas this priming activity was completely lost in IFN-DCs raised from immunoselected CD14+ PBMCs. This phenomenon was associated with a more mature phenotypic profile of adherent PBMC-derived IFN-DCs (in terms of CD83, HLA class II, and costimulatory molecule expression) compared with purified CD14+ monocyte-derived IFN-DCs. The evidence that adherent PBMCs contained a significant percentage of NK cells, which underwent phenotypic and functional activation upon IFN-α, but not IL-4, differentiating culture, further suggested a role for positive DC/NK cross-talk in IFN-DC development. Indeed, the presence in adherent PBMCs of CD16+ NK cells, but not of CD19+ B lymphocytes (representing, however, the main nonmonocytic contaminant of adherent PBMCs), promoted the differentiation of IFN-DCs attaining a more mature phenotype and exerting more efficient antitumor T cell priming. The positive cross-talk occurring between NK cells and DCs upon IFN-α treatment was clearly bidirectional and appeared to occur mostly through an indirect, rather than a direct, effect. In fact, purified NK cells were only marginally boosted by IFN-α alone, whereas they underwent potent activation when treated in the presence of differentiating IFN-DCs. The observation that the phenotypic and functional properties of human IFN-DCs derived from adherent PBMCs mostly depended on the positive cross-talk occurring between DCs and NK cells upon IFN-α treatment is in line with the recent demonstration that differentiation and maturation of fully functional DCs may rely on their cooperation with other immune cell subsets (20, 22). Studies focused on NK cell/DC interactions have, in fact, highlighted the crucial role of this reciprocal cross-talk in inducing activation of both cell types and in regulating immune responses at the interface between innate and adaptive immunity (18, 19, 20, 21, 22, 23, 27, 28, 29, 30). IFN-α is indeed a cytokine with known pleiotropic activity on several immune cell compartments (15). In fact, in addition to its activity on the monocyte/macrophage subsets (17), IFN-α is involved in NK cell activation (31), the Ig-type switch in B lymphocytes (16), and Th response modifications (15). Previous studies in murine and human models have investigated the potential mechanisms mediating DC/NK reciprocal activation in terms of soluble factors involved and requirement for cell-to-cell contact (23). Our data show that the high levels of TNF-α detected in differentiating IFN-DC cultures, released by either NK cells or DCs, could represent an important factor for the reciprocal activation of these two cell subsets. This hypothesis is supported by the evidence that IFN-DCs raised from CD16-depleted PBMCs are characterized by low CD83 expression and reduced TNF-α production, and that the blockade of TNF-α by a neutralizing Ab during DC differentiation causes a significant, although not complete, inhibition of CD83 up-regulation in IFN-DCs differentiated in the presence of NK cells. The finding that TNF-α may play a role in this phenomenon has been reported by Piccioli et al. (23), who demonstrated that DC maturation and cytokine production mediated by NK cells was driven by cognate interactions and depended on endogenously produced TNF-α. However, other soluble factors or receptors triggered during direct cell-to-cell contact can be involved in this phenomenon. The absence of any detectable release of IL-12 by IFN-DCs (R. Valenti, L. Rivoltini, and G. Parmiani, unpublished observation) suggests that DC/NK cross-talk might not rely on this cytokine, as already shown by Gerosa et al. (20). Independently from the mechanism, the efficient cross-talk between DCs and NK cells promoted by IFN-α could be exploited for promoting the generation of more efficient antitumor T cell responses in cancer patients. Indeed, the ability of IFN-DCs differentiated in the presence of NK cells to promptly activate tumor Ag-specific T cell responses may open new perspectives in the development of new protocols of DC-based cancer vaccines. Additionally, the administration of IFN-α or other cytokines with more efficient NK stimulatory capacity, such as IL-2 or IL-15 (31), for promoting bidirectional cross-talk between DCs and NK cells in vivo could be considered a potential strategy for increasing DC priming ability and eventually inducing more efficient immune-mediated tumor growth control in vivo. We thank Paola Squarcina for skillful technical support, and Drs. Claudia Lombardo, Arabella Mazzocchi, and Fernando Ravagnani (Unit of Transfusion Medicine, Istituto Nazionale Tumori, Milan, Italy) for buffy coat supply and HLA typing. Additionally, we are grateful to Dr. Daniela Pende (Istituto Nazionale per la Ricerca sul Cancro, Genova, Italy) and Dr. Maria Ferrantini (Istituto Superiore di Sanita, Rome, Italy) for providing reagents and for helpful discussion, and to Grazia Barp for excellent editorial assistance. ↵1 This work was supported in part by grants from Italian Association for Cancer Research (Milan, Italy), Italian Ministry of Health (Rome, Italy), and Ministry of Education, University, and Research (Rome, Italy; FIRB RBNE017B4C). ↵3 Abbreviations used in this paper: DC, dendritic cell; CEA, carcinoembryonic Ag; iDC, immature DC; IFN-DC, IFN-α-induced DC; mDC, mature DC; MART, melanoma Ag recognized by T cells. Rescigno, M., P. Borrow. 2001. The host-pathogen interaction: new themes from dendritic cell biology. Cell 106:267. Banchereau, J., B. Schuler-Thurner, A. K. Palucka, G. Schuler. 2001. Dendritic cells as vectors for therapy. Cell 106:271. Fong, L., E. G. Engleman. 2000. Dendritic cells in cancer immunotherapy. Annu. Rev. Immunol. 18:245. Nestle, F. O.. 2000. Dendritic cell vaccination for cancer therapy. Oncogene 19:6673. Dhodapkar, M. V., J. Krasovsky, R. M. Steinman, N. Bhardwaj. 2000. Mature dendritic cells boost functionally superior CD8+ T-cell in humans without foreign helper epitopes. J. Clin. Invest. 105:R9. Dhodapkar, M. V., R. M. Steinman, J. Krasovsky, C. Munz, N. Bhardwaj. 2001. Antigen-specific inhibition of effector T cell function in humans after injection of immature dendritic cells. J. Exp. Med. 193:233. Lutz, M. B., G. Schuler. 2002. Immature, semi-mature and fully mature dendritic cells: which signals induce tolerance or immunity?. Trends Immunol. 9:445. Gilliet, M., M. Kleinhans, E. Lantelme, D. Schadendorf, G. Burg, F. O. Nestle. 2003. Intranodal injection of semimature monocyte-derived dendritic cells induces T helper type 1 responses to protein neoantigen. Blood 102:36. Santini, S. M., C. Lapenta, M. Logozzi, S. Parlato, M. Spada, T. Di Pucchio, F. Belardelli. 2000. Type I interferon as a powerful adjuvant for monocyte-derived dendritic cell development and activity in vitro and in Hu-PBL-scid mice. J. Exp. Med. 191:1777. Parlato, S., S. M. Santini, C. Lapenta, T. Di Pucchio, M. Logozzi, M. Spada, A. M. Giammarioli, W. Malorni, S. Fais, F. Belardelli. 2001. Expression of CCR-7, MIP-3β, and Th-1 chemokines in type I IFN-induced monocyte-derived dendritic cells: importance for the rapid acquisition of potent migratory and functional activities. Blood 98:3022. Lapenta, C., S. M. Santini, M. Logozzi, M. Spada, M. Andreotti, T. Di Pucchio, S. Parlato, F. Belardelli. 2003. Potent immune response against HIV-1 and protection from virus challenge in hu-PBL-SCID mice immunized with inactivated virus-pulsed dendritic cells generated in the presence of IFN-α. J. Exp. Med. 198:361. Le Page, C., P. Genin, M. G. Baines, J. Hiscott. 2000. Interferon activation and innate immunity. Rev. Immunogenet. 2:374. Le Bon, A., G. Schiavoni, G. D’Agostino, I. Gresser, F. Belardelli, D. F. Tough. 2001. Type I interferons potently enhance humoral immunity and can promote isotype switching by stimulating dendritic cells in vivo. Immunity 14:461. Montoya, M., G. Schiavoni, F. Mattei, I. Gresser, F. Belardelli, P. Borrow, D. F. Tough. 2002. Type I interferons produced by dendritic cells promote their phenotypic and functional activation. Blood 99:3263. Ferlazzo, G., M. L. Tsang, L. Moretta, G. Melioli, R. M. Steinman, C. Munz. 2002. Human dendritic cells activate resting natural killer (NK) cells and are recognized via the NKp30 receptor by activated NK cells. J. Exp. Med. 195:34. Kelly, J. M., P. K. Darcy, J. L. Markby, D. I. Godfrey, K. Takeda, H. Yagita, M. J. Smyth. 2002. Induction of tumor-specific T cell memory by NK cell-mediated tumor rejection. Nat. Immunol. 3:83. Moretta, A.. 2002. Natural killer cells and dendritic cells: rendezvous in abused tissues. Nat. Rev. Immunol. 2:957. Piccioli, D., S. Sbrana, E. Melandri, N. M. Valianti. 2002. Contact-dependent stimulation and inhibition of dendritic cells by natural killer cells. J. Exp. Med. 195:335. Belli, F., A. Testori, L. Rivoltini, M. Maio, G. Andreola, M. R. Sertoli, G. Gallino, A. Piris, A. Cattelan, I. Lazzari, et al 2002. Vaccination of metastatic melanoma patients with autologous tumor-derived heat shock protein peptide-complex-96: clinical and immunological findings. J. Clin. Oncol. 20:4169. Trinchieri, G.. 1998. Proinflammatory and immunoregulatory functions of interleukin-12. Int. Rev. Immunol. 16:365. Santodonato, L., G. D’Agostino, R. Nisini, S. Mariotti, D. M. Monque, M. Spada, L. Lattanzi, M. P. Perrone, M. Andreotti, F. Belardelli, et al 2003. Monocyte-derived dendritic cells generated after a short-term culture with IFN-α and granulocyte-macrophage colony-stimulating factor stimulate a potent Epstein-Barr virus-specific CD8+ T cell response. J. Immunol. 170:5195. Carbone, E., G. Terrazzano, G. Ruggiero, D. Zanzi, A. Ottaiano, C. Manzo, K. Karre, S. Zappacosta. 1999. Recognition of autologous dendritic cells by human NK cells. Eur. J. Immunol. 29:4022. Wilson, J. L., L. C. Heffler, J. Charo, A. Scheynius, M. T. Bejarano, H. G. Ljunggren. 1999. Targeting of human dendritic cells by autologous NK cells. J. Immunol. 163:6365. Nishioka, Y., N. Nishimura, Y. Suzuki, S. Sone. 2001. Human monocyte-derived and CD83+ blood dendritic cells enhance NK cell-mediated cytotoxicity. Eur. J. Immunol. 31:2633. Zitvogel, L.. 2002. Dendritic and natural killer cells cooperate in the control/switch of innate immunity. J. Exp. Med. 195:F9.